Premise- The contestants, appearing in a team of two, start with $1,000,000, divided in 50 $20,000 stacks. The contestants will have to answer a total of seven questions throughout the game. Before each question is asked, the contestants will have to choose one of two categories shown on a big screen. After a category has been chosen, the contestants are shown four possible answers (three answers on questions 4-6, and two answers on the seventh question), over the “drops”. After the host has read the question, the contestants will have one minute (75 seconds on the fourth and fifth questions, 90 seconds on the sixth question, and no time limit on the seventh question) to place their money on what they believe to be the correct answer(s). With each round of spreading the money between the various drop zones, one drop zone must always remain clear. If the contestants place their money on the correct answer, they get to keep their money. If the contestants place their money on an incorrect answer, that money will be dropped through the drop zone and lost forever for that team. The game ends when a team either loses all of their money or answers all seven questions correctly. If the contestants are successful in answering all seven questions correctly, they keep whatever money they have left in play in the game. During the game after time has expired for any question, the contestants can use a “lifeline” called “Quick Change”. Using the “Quick Change” lifeline gives the contestants 30 seconds to make any money changes between answers and can only be used once per game. Before I begin my review, I would like to bring your attention to two things. First, the reason why I posted this review so early (before Thursday) is because this show will be airing for this week only and I want everyone to take a look at the show before this week is over, if you haven’t already. Second, I posted an article spotlighting the premiere of Million Dollar Money Drop by comparing it to the U.K.’s The Million Pound Drop. With this in mind, I will be making comparisons between the two shows in order to enhance my review. Like the U.K. version, Million Dollar Money Drop will only be a one-week event, probably airing every few months at a time. I like this kind of strategy by FOX network because I believe that this will pull a decent amount of viewers because of its limited availability. This was the similar strategy employed by ABC’s Who Wants To Be a Millionaire, when the show previously aired four nights a week in primetime that made that show as successful as it is today. But, I fear that this show may not reach a staggering amount of viewers because of the show not airing on one of the “Big Three” networks (ABC, NBC, CBS). Million Dollar Money Drop manages to maintain a decent level of suspense, excitement, and challenging gameplay as on the U.K. version. The host, Kevin Pollack, has the similar hosting style of Davina McCall, the host of the U.K. version, in terms of being a “straight-forward” and “to-the-point” host. 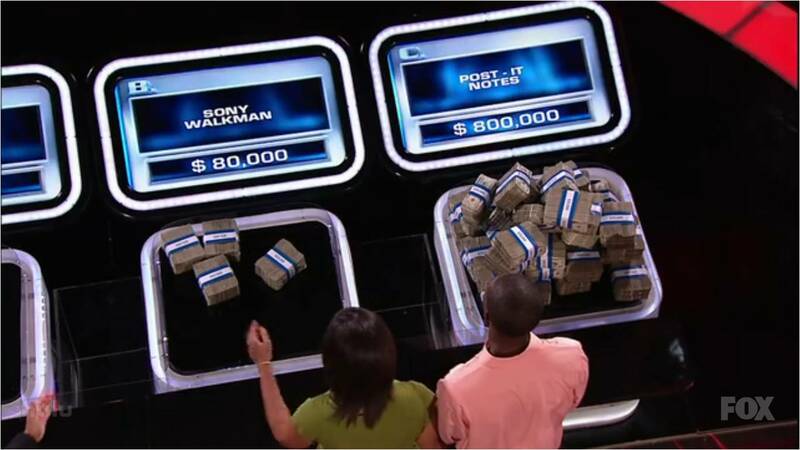 However, I didn’t like it when Pollack said “How the hell did that get there?” when referring to contestants Brittany and Gabe from the first episode placing $20,000 on a random (incorrect) answer during the first question. There is no reason why the host should be cursing on television, especially when their show is airing during the “family nighttime” slot (8pm-10pm). A game show host should not have to work “blue”, but that’s just me. In addition to that, my only other three problems with the show are the gameplay difficulty and the questions. There are three factors that affect the difficulty level of the U.S. version of the game: the “Quick Change” lifeline, the increase of the money stacks, and the increase in the time limits from the fourth through final questions. I wasn’t too crazy about Million Dollar Money Drop giving the contestants a lifeline to help them throughout the game because it strays away from the original U.K. gameplay difficulty. 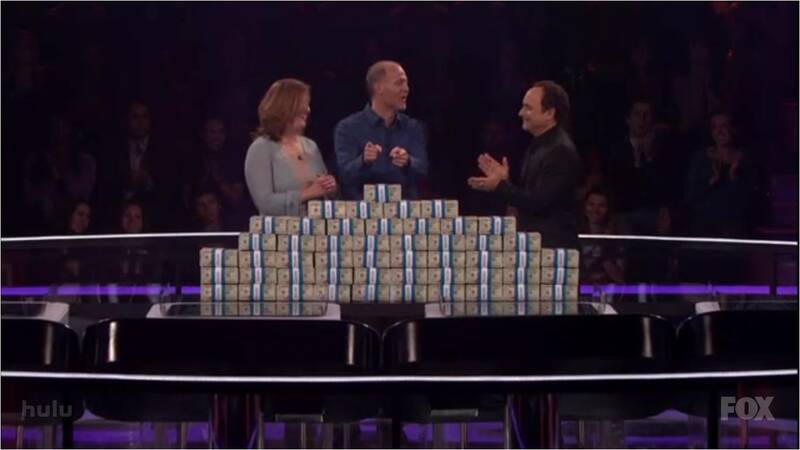 My opinion of the lifeline changed a bit as I watched the lifeline being played effectively when the couple playing on the second episode used the “Quick Change” to move $120,000 to an answer that they placed $880,000 on because of a previous last second decision that was made before time expired for that question. With the use of the lifeline, the couple managed to avoid losing that $120,000 for that round, even though they still lost the game. I’m just glad the U.S. version just stuck with the one lifeline, and not with the generic “three” lifelines, or helps, or whatever they call them. In addition to the lifeline, the increase of time limits also decreases the level of difficulty. As expressed in the premise section, the time limits for the fourth and fifth questions have been increased to 75 seconds; the sixth question time limit has been increased to 90 seconds, and there is no time limit on final question, although Pollack will give the contestants an “extra fact” about the question and the contestants will have a final 60 seconds to think about their final answer. The increased time limits and the “extra fact”, like the lifeline, also decreases the game difficulty and makes the game less challenging. The only aspect of Million Dollar Money Drop that makes it a little bit more difficult than the U.K. version is the increase of the money stacks, from 40 up to 50. This makes the $1,000,000 more difficult to manage between answers within the alloted time limit. I have also noticed that the questions on Million Dollar Money Drop are strangely similar to the $200,000-$2,000,000 questions on the 2001 FOX game show Greed; Million Dollar Money Drop mainly asks statistical questions, or “Which came first/earliest/later?” type of questions. On a side note, I think the ominous music cues being used for the moments before the opening of the incorrect answer drop zones subdues the suspense a little because you can tell when the drop zones will open by timing when the music stops, as opposed to the U.K. version, where dead silence fills the air in the studio during the moments before the opening of the drop zones, not knowing when the drop zones will open. Overall, Million Dollar Money Drop still has the contestants pressured by the clock and the contestants, home audience and studio audience hanging on to the edge of their seats, but the U.K. version is still more challenging. The U.S. version is also more emotional than the U.K. version, like the one contestant who was on his knees in tears on the premiere episode because they lost $800,000 in cash on an incorrect answer, but also less challenging because of the use of the lifeline and the increased time limits on some questions. But, I guess the reason why the U.S. version added the use of the “Quick Change” is because the U.S. version wants to be more successful in giving away more money than on the U.K. version. This is a pretty good show to watch (for a FOX game show), and make sure you get a chance to see an episode this week! And by the way, Merry Christmas and Happy Holidays everyone!